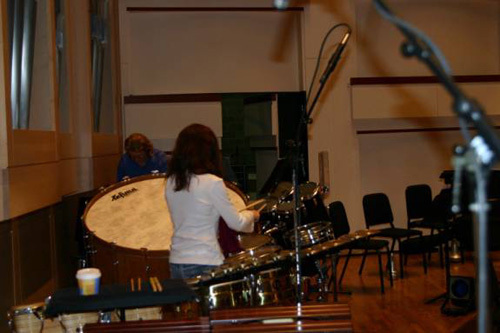 Here is a view of a concert I recently (if it’s still 2005) performed with the Charlotte Symphony Orchestra. I normally perform about 150 services a year with this orchestra and have been doing so for 15 years. 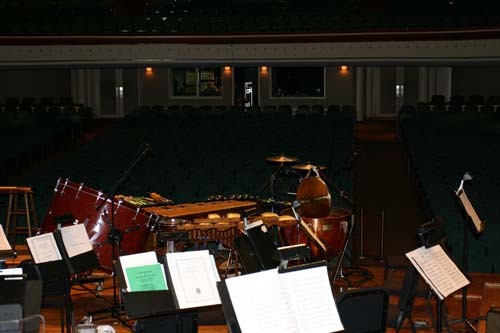 This concert featured percussionist Evelyn Glennie who travels the globe performing solo concerts and concertos. 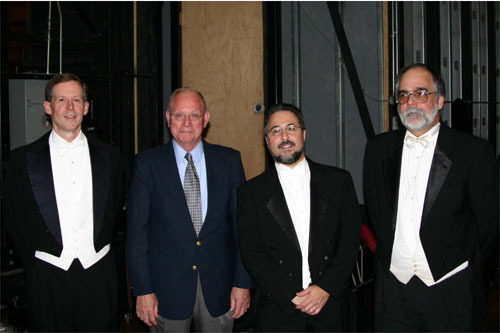 In this case we were performing Joseph Schwantner’s percussion concerto which was originally written for New York Philharmonic Percussionist Chris Lamb. This concerto has been getting lots of play over the years (it was written in 1996) and is a very accessible piece for audiences and not too difficult too prepare. Since rehearsal time is often very limited (in this case we had just two short rehearsals to get it together) preparation is vital. I spent about a month working on my part which consisted of Xylophone, Bass Drum, Chimes, Triangles, woodblocks, gong and Anvil. 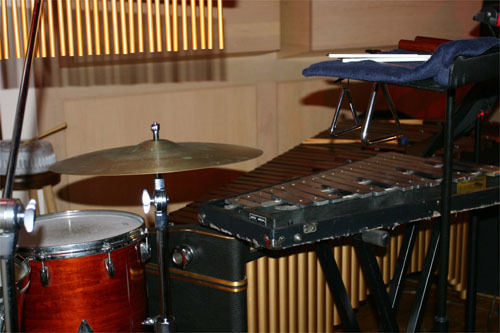 The xylophone part is especially difficult and is closely intertwined with the solo part. 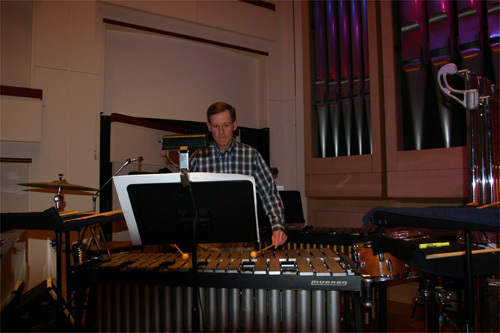 Likewise with the Vibraphone part played by Peyton Becton and the Marimba part played by Jim Ulacky. 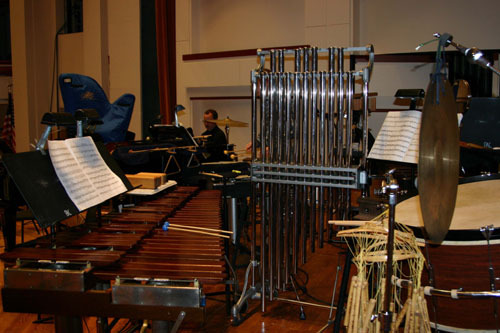 This piece is unique in that it uses two separate solo percussion setups-one in front of the orchestra and one in the back with the section players. The 1st and 3rd movements take place in the back while the 2nd movement is performed solo up front. There are many odd meter groupings and tempo changes. Fortunately we had a very good conductor for the concert, Christopher Warren who was very clear and precise. He also was very flexible as far as suggestions and worked with us in a wonderfully relaxed manner. This is not always the case in the orchestra world were time is of the essence and conductors tend to not be flexible. Evelyn was also wonderful to work with and it was really fun to have her set up in the back with us for the two movements we played on. We were really able to lock-in because of this. Below are some pictures and descriptions of the setups for the concert. 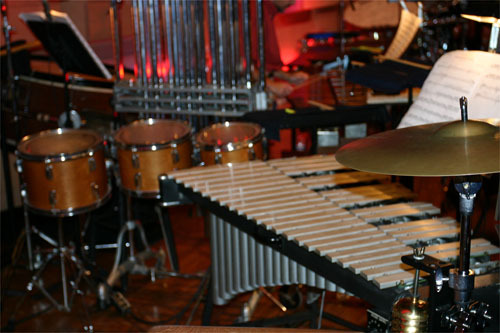 Here are a few pictures of Evelyn’s setup in the back with the other percussionists. 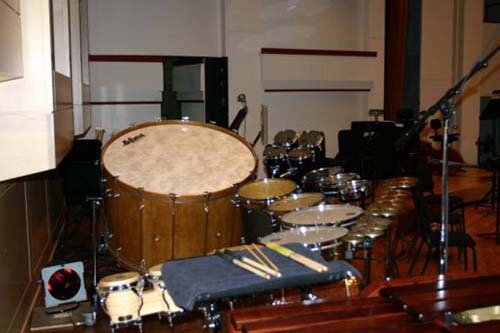 This set up is used for movements one and three. Here is a shot of the front setup used in Movement 2. This is a picture of Rick’s setup. Here’s another shot of Ricks setup. 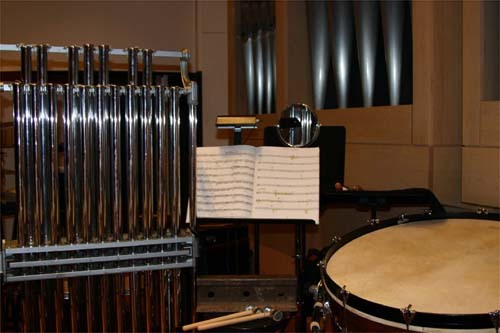 Notice the mirror which is vital since all the chime and Bass Drum passages are played with your back to the conductor. This is necessary because of space limitations on the stage. Here’s another shot of Peyton’s setup. 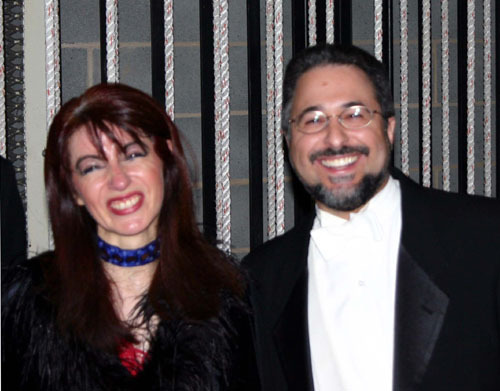 Evelyn and Rick -- post concert. Here is a picture of the section with Harold Jones (Peyton’s teacher) who stopped by for a listen. © 2002-2005. Rick Dior and Acoustic Barn Productions. All rights reserved. No portion of this website may be duplicated without express written permission.